Cambridge se manier van taalonderrig verskil baie van die soort onderrig waaraan ons gewoond is: Dit fokus op uitdrukkingsvermoë. 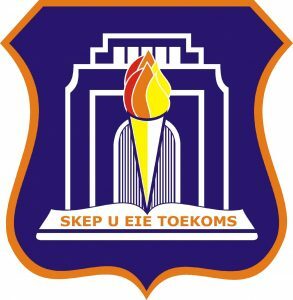 Studente in Hoërskool Raslouw skryf dus baie opstelle, maar om ń goeie opstel te kan skryf is dinge soos spelling, grammatika en ander sake wat ons gewoonlik onder taalleer aantref baie belangrik. 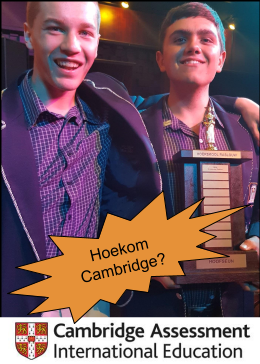 Jayden Coetzee is tans in graad 11 en berei voor vir Cambridge se AS Level-eksamen. As deel van sy jaarafsluitingswerk het hy hierdie uitstekende opstel geskryf as deel van die opdrag getiteld Imaginative Writing. In Engels het hy reeds ń onderskeiding in graad 10 vir Cambridge se IGCSE-eksamen behaal, ons sien dus uit na wat in die toekoms gaan gebeur. 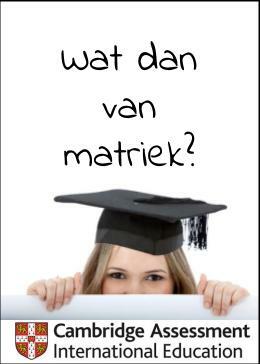 Juf Riekie het een tydige waarskuwing by die lees hiervan: The essay is written in a narrative frame format, which is quite difficult! Well done, Jayden! As I walk slowly towards my old ragged car that looks as if it’s held together with bailing wire and duct tape, and running on prayers and borrowed time, I have only the thought of sadness and remorse in my heart, because I know on this day I say goodbye to the most important person in my life. Behind me, is my old house that looks a little better than a glorified shed, even though I have tried to modernize it through different paints and varnishing the wood frame around it, but right now the roof is sagging a little to the right, hurting anyone who looks at it. Maybe I’ll use the insurance money to patch it up, or maybe just begin fresh. I force the crying car door open with sufficient force, just enough so it doesn’t bend, and also enough so that it opens with a reasonable speed. Into the car I stumble. I have had this car for four years now, and it has never given engine problems, even though it’s literally rust and rubber. My destination is Massachusetts General Hospital. My dad lays there, and my mom has never left his side for the last three months. I was the one running errands for my mom, like getting her food and bringing her clean clothes daily. As I arrive at the hospital, and walk in towards the corridor, it feels stuffy and there is an undertone of chlorine and bleach. The tiles on the floor are scarred from rubber wheels being rushed over them too many times. On the left is my Dad’s room, I enter with a dropped feeling in my heart. “Hi Mom, how’s dad?” I said in a scaling voice. I wonder why my sister isn’t here. Waking up is no longer the pleasure it was. There is a fleeting moment when I am whole again, but it evaporates faster than summer rain off the scolding earth. Why can’t I sleep early so that I’ll actually be able to wake up before eleven o’clock? I struggle myself awake and mend over how I am going to face my family today at the hospital. Maybe I should just say nothing at all and walk in. That’s if I’m actually on time before the worst happens. I plummet out of bed onto my wooden floor, resulting in my shoulder taking all the force of the fall and my body. Ouch! I struggle up and start waddling to the kitchen to make coffee. Within three minutes I’m sipping black coffee straight from my portable mug. From the kitchen, I go to my room to put on some shoes then I’ll be ready to face the music. Whatever happens, know that I am sorry. I jog out of my house, barely locking my door behind me, and launch myself towards my car door. At least my car is in a more stable shape than me. I sit in my car, smelling the stench of stagnant air and warm car seats. Here I sit, behind my steering wheel, with its modernized leather coating and smooth feeling. I think to myself why am I always behind? Where did it all go wrong? I put the pedal to the metal and start moving forward. Isn’t that just the best thing to do? To just keep looking forward and not going back to the past. The hospital is twenty-five minutes away, so I have enough time to get my act together before then. I arrive in the hospital’s parking terrain, with hopelessness clouding my vision, I push forward. This will be the first time my family sees me in six months, and a lot has happened in six months. I ask at reception where my dad lies, H17 is the ward number and the room number. That is my destination. I slide the room curtain just a little to the side so I can sneak through. My brother and mom are in tears. My brother makes eye contact with me and starts throwing words at me. He says it’s my fault and I don’t care about dad and I was never there for anybody. I repulse by saying he doesn’t have a right to speak and it’s nobody’s fault dad died. He continues aggravating himself towards me and Mom. Out the corner of my eye, my mother is oddly intrigued at a scalpel lying on a table a few feet away from her.